This barrel bag features a skull and crossbones pattern. So if you're just a little bit sweet and just a little bit edgy this bag is the perfect balance, just like you! 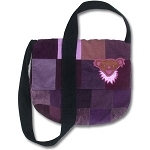 This bag features a button closure and an outside zipper pocket for added convenience.